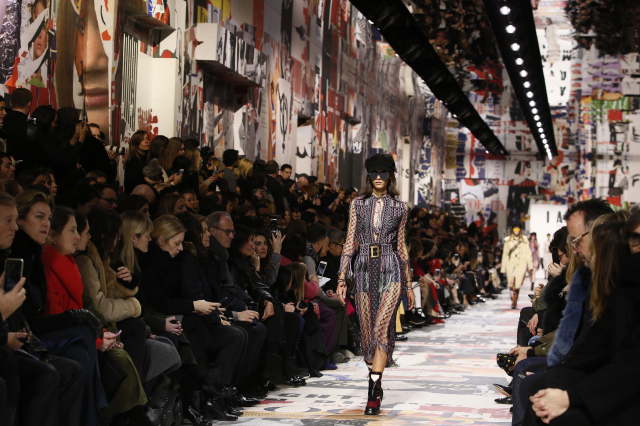 PARIS (AP) — The subzero temperatures didn't dampen Paris Fashion Week, which began with dark 80s atmospherics at Saint Laurent and a bright flower-power ode to female empowerment from Dior. Gabriella Wilde's frayed silk Dior skirt was a little too diaphanous for the Paris winter weather. The British actress shivered at the Dior photo call before she quickly ducked inside to join Cara Delevingne and Dylan Penn. A heaving mass of celebrities, editors and photographers soon thawed guests that had arrived at Paris' Rodin Museum to see Dior designer Maria Grazia Chiuri's latest artistic production. The venue was emblazoned with mantras such as Hillary Clinton's "Women's Rights Are Human Rights," providing a clue that Chiuri — the fashion house's first female chief — would press ahead with the feminist themes that have proved the best-sellers from her previous collections. The show — a brightly colored, patchwork-rich ode to flower-power, female empowerment and the '60s — didn't disappoint. Orange shades and peaked dark cap hats mixed with check menswear jackets and assertive black thigh-high biker boots. Abundant woolen looks — like a thick knit maroon dress with a cinched waist — captured the age of the awakening of women's lib. And flowers were ubiquitous. The program notes said Tuesday's Dior collection marks 50 years since 1968 — the turning point of the civil rights movement — and the way in which Vogue magazine under Diana Vreeland mirrored that shift in a "sartorial revolution." The last look — a psychedelic column dress with embroidered tulle blooms in traffic-stopping reds, blues and yellow — took the concept of flower power into a whole new gear. In a strong-shouldered red military jacket, actress Charlotte Gainsbourg posed for cameras ahead of Saint Laurent's warehouse-style show in front of the Eiffel Tower. An eerie feeling pervaded the collection of clothes that recalled the 1980s and were done in black or doused in glitter. The dim beam light in the show decor evoked a hybrid of a disco and a prison courtyard. A smoke machine chugged out wisps of mist. Some guests bumped into each trying to find their seats, and the first of the black styles were so faintly lit the detail of the clothes was lost. The effect was intentional. Anthony Vaccarello has consistently created dark atmospherics in his presentations since becoming Saint Laurent designer in 2016. Huge fringed boots, black mini dresses and voluminous sleeves in black gave way to loose metallic disco dresses with strong shoulders and plunging necklines. They shimmered in the dappled light. There was a brooding sensuality in many of the details, such as shiny black leather gloves or a black fur band wrapping the bust that was set against naked shoulders. A black column dress that evoked a tuxedo and had a front section artfully cut out. Instead of a white shirt, the opening revealed a bare chest. French fashionistas flocked to the front row beneath the lofty ceilings of the Petit Palais — from model Farida Khelfa to legendary couturiere Christian Lacroix — in a testament to the growing star power of designer Simon Porte Jacquemus, whose collection now opens the Paris Fashion Week calendar. Capitalizing on the current buzz, the 28-year-old this month announced he's expanding into menswear. His fall-winter display went on a journey to Morocco, a country that Jacquemus has said he often retreats to after Fashion Week. Exaggerated proportions of fabric defined the exotic silhouettes— in split skirts, gargantuan wrap-hats, pleated culottes or coats with a round. "This winter, I got lost in the souks again," Jacquemus quipped. A silken kaftan in light French beige flowed with an Eastern feel thanks to loose proportions — and trompe l'oeil pants that billowed by like a skirt. The well-executed 58-piece collection featured pigment colors and had several standout moments. The front of one frayed skirt in dark vanilla was imagined as a hoop of fabric. And the stilettos, with heels made of giant colored beads, had many in the audience whipping out their cameras. Marine Serre, 26, hosted her debut ready-to-wear show in Paris, hot off the (stylish) heels of winning the prestigious LVMH Prize. She was the first designer in history to have won the French luxury giant award without having launched an official brand. The French designer — who's worked at Balenciaga — has quickly won praise for her athletic silhouettes that were given fashion-forward vibrancy with prints. In Tuesday's eclectic collection, Serre's foulard-print style pollinated onto loose layered boho skirts amid flashes of bright color. Body-hugging leggings, bodices and head caps had a sportswear feel with a crescent-moon print. In a surreal turn, a 1-meter-square silk scarf was used as an earring.